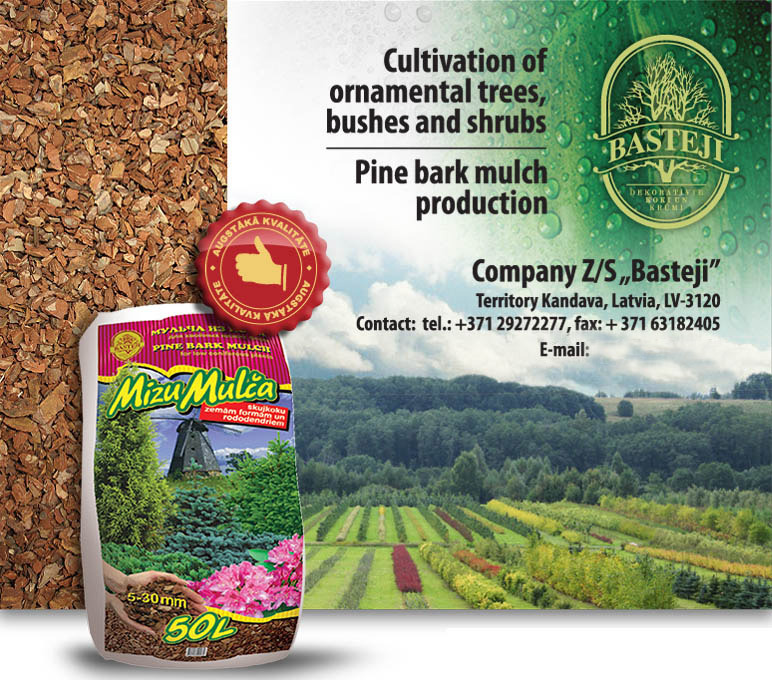 Z/S "Basteji" is a family funded company, that grows ornamental trees and bushes as well as produces pine bark mulch. Everything started in the late 1993, but production of pine bark mulch started in 1997. We are reknown as initiators of mulch production, because we are the first manufacturer in Eastern Europe and also the only bark mulch manufacturer up to 2004. In 2003, we had major reconstruction and modernization of the factory according to EU quality standards. Experience, skilful and anthusiastic staff, highest quality raw materials, and innovative products are cornerstones of our work. No one in Europe has been able to imitate it. Fifteen years of experience in mulching material production. Conformity of production process and products to European standards. You will always have the best product quality and the correct capacity decleared on the bag. Chemically processed wood biomass is not used to produce mulch. Mulch processing materials do not contain quarantine pests and fruit pathogens. Raw materials do not contain mechanical admixtures and synthetic colouring. Fill in the information about yourself, and you will be contacted by our company representative to coordinate prices and delivery. Fields, marked with * are required!